FIRST, A SNAPSHOT. A SQUIRREL HILL COUPLE, NOW IN THEIR EIGHTIES, IN THE BLACK-AND-WHITE DAYS OF THEIR YOUTH, HAND-IN HAND, EYES LOCKED IN THAT EARLY LOOK OF LOVE. SHE’S IN A DARK DRESS WITH PEARLS ACROSS HER COLLARBONE; HE’S IN A LIGHT SUIT, COMPLETE WITH TIE BAR, EVERYTHING ABOUT THIS PHOTO SPEAKS OF TIMES LONG GONE, BUT FOR PITTSBURGH ARTIST MICHAEL FRATANGELO, IT’S JUST THE BEGINNING. The man in the snapshot, a retired preacher, becomes his essence in shapes and colors on the canvas. His head is a circle- white in the middle, ringed in yellow, ringed once more in blue. His body, curved stripes of white, red, yellow and blue, one black L down and across his middle. His wife full of circles and curves- red-circled face, dark hair, a long green stretch of curves around her breast and down again into her middle, circling back in on itself, a green dot inside the concluding loop. The background is all the same matching green. Lastly, from the upper left corner, come white and yellow beams, which pass over the woman’s head, and converge into a single point against the man’s blue-circled head. Fratangelo explains how blue is a very spiritual color; a color often seen around the Virgin Mary. Green is a fertile color used to express the couple’s three children. The three lines are for the trinity- Father, Son, and Holy Spirit. The same might be said for Fratangelo’s path to this moment. A Pittsburgh native, Fratangelo went off to Penn State for college. “I did not intend to be an artist,” he says. But then he took a painting class. “All the students started gathering around my canvas. Other professors started coming because I had a different sense.” His painting professor took him aside to make sure Fratangelo knew he had something special. “I took that as a sign,” he says, enrolling in a drawing class the next semester. The same thing happened. “It’s just like I have a different sense of color and shape,” Fratangelo says. “I didn’t really understand it- I just did it.” He’s quick to note that his particualr abilities are not the result of Synesthesia, a condition wherein people’s five senses become tangled. Since those first art classes, Fratangelo has learned to just go with it. He’s looked to artist Wassily Kandinsky, musician John Coltrane, and mythologist Joseph Campbell for inspiration and guidance. The first two wrote about the spirituality of their respective crafts. 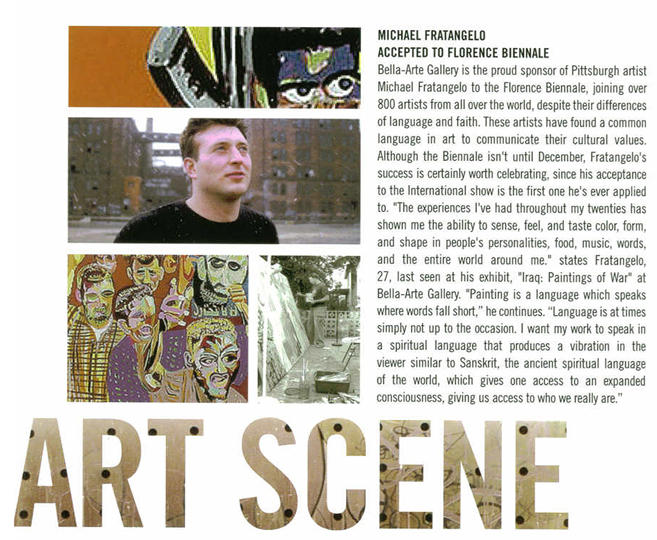 Fratangelo reads Campbell for his thoughts on looking beyond the economics and politics of art. The rest is just accepting what comes and knowing thats it’s a reliable process. “I don’t attend church regularly, but I go to my studio. 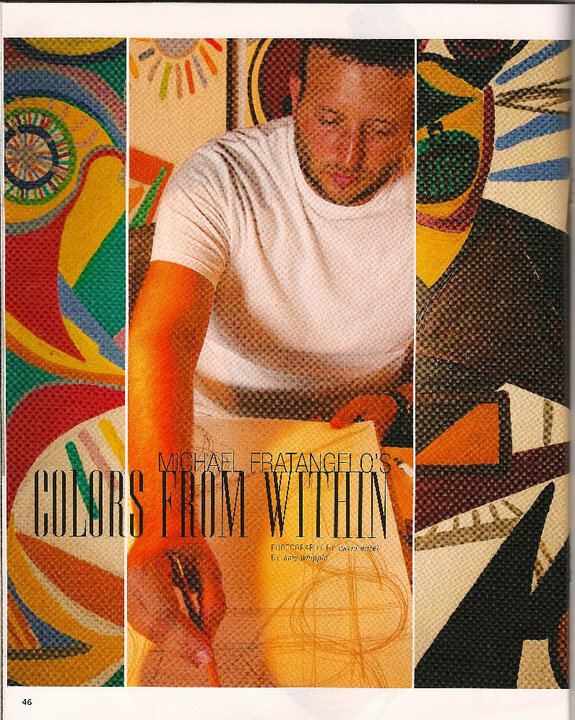 That’s my spirtual practice.” As a result, Fratangelo believes what he does “is not in a book. You can’t learn it. I consider it a gift.” He’s positive that most people have a unique abiity somewhere in them, too. “Very few people find it,” he says. Now that he knows where his life should be going, his biggest challenge has been getting the word around about these portraits. He’s not unknown in the city, though. By day, Fratangelo is a middle school art teacher- something he also believes he’s led to do but doesn’t see himslef doing forever. In 2004, he had a much talked about exhibit of Iraq War portraits (done in much the same style as the current metaphysical portraits). Commissions- especially since school is out for the summer- are starting to stack up, but he’s not obsessive about chasing people down in the strrets. “I think if I just take the right steps, it’ll happen on its own,” he says, which seems to be working thus far. 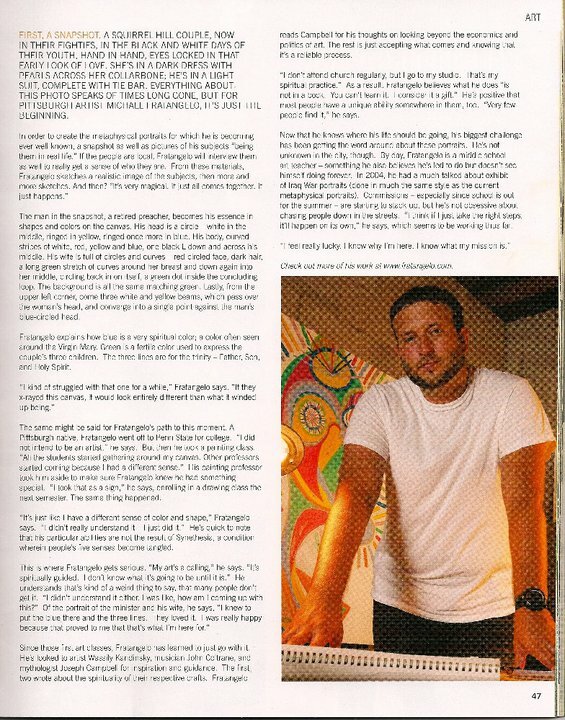 Check out more of his work at www.fratangelo.com.